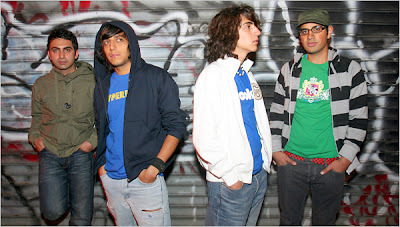 Tehran-based rockers Hypernova have been getting a lot of buzz the last couple of weeks – really big-time buzz from outlets like MTV, VH1, the Telegraph, ABC news, the New York Times (the article is archived but you can see the text on the mshab blog), and others. Though most of the coverage focuses on the fact that their music is illegal in Iran because rock music was officially outlawed by Ahmadinejad, Hypernova actually sound pretty good regardless of their rebellion. Like many Iranians, it seems the band is stuck between the totalitarianism when in their own country and the stigma of coming from a totalitarian place when abroad; they were scheduled to play SXSW but got stuck in Dubai when their visas didn’t come through in time. But they made it to New York, and their rebellion is pretty appealing nonetheless: their album is titled “Who Says You Can’t Rock in Iran?” Most reviews so far compare their music to The Strokes, and quite rightly so – the same sort of punky, indie-rock vibe is evident in Hypernova songs.